When you think of sports gambling, perhaps the image of a bookie comes to mind. “I’ll offer you even money on Detroit,” he might tell you, which means if you bet $10 and Detroit wins, you’ll get $20 back. Horse racing uses a different approach, called the parimutuel system. Because it often causes confusion for first-time bettors, and in honor of this Saturday’s Kentucky Derby, I put together an overview of how it works. Of course, such an undertaking would be next to impossible without some outside help. I’m proud to introduce my friend Nicolle, a turf writer who kindly agreed to provide some inside perspective. I got into horse racing because it combined two of my loves: pretty horses and obscure trivia. I focus most keenly on Chicago-area horse racing; here I am hanging out with my Illinois-bred friend Super Soldier. I also follow the progeny of 2007 Preakness Stakes winner Curlin. As such, I may die of abject excitement when Curlinup and Chicken Noodle (the first two Illinois-bred Curlin babies) make their racing debuts. I have a Clark Kent job in computer security, but my nights and weekends are spent handicapping, writing, or watching live racing at Hawthorne Race Course and Arlington Park. As for Jeopardy!, I am currently in the eighteen months of hanging by the telephone – for the second time in my life, since I made it as far as the in-person auditions in both 2009 and 2014. 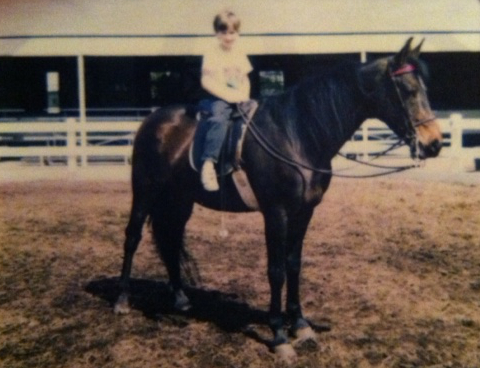 Nicolle writes Blinkers Off, a blog on horse racing, and has a very popular Twitter account. Thanks, Nicolle! This post is split into two parts: (1) how parimutuel wagering works and (2) types of bets at the track. To skip to the second part, click here. With a bookie, it’s just the two of you. If you win the bet, the bookie has to cough up the cash; of course, there’s a risk that he will disappear, and you’ll be unable to collect. The most money is placed on horse #5, Excellence Squared. This makes him the favorite. If he wins, the $120 in the pool will be split evenly among the $40 bets, so each $1 wager yields a return of $3. When you accept the bookie’s offer, you “lock in” your potential payout. If Detroit’s star player gets injured before the game but after you’ve shaken hands, the odds on your bet don’t change, even though Detroit’s chances probably went way down. Tough break! In parimutuel wagering, the odds aren’t set until all of the bets are in and the race begins. You might think you’re getting a good deal when you place your bet, but as more money comes in, the odds might shift to something less (or more) favorable. Here are the odds for our horses. As an example, our favorite, Excellence Squared, will pay $6 on a winning $2 ticket, or a profit of $2 for every $1 wagered. That means odds of 2:1. Note that for each horse, the amount of money wagered is inversely proportional to the payout. In the racing form – a guide that contains statistics for that day’s competitors – horses have morning line odds assigned to them. These are merely educated guesses as to what the final odds might be. Morning lines might be good predictions, but the actual line will often diverge over the course of the day. On rare occasions, the linemaker just misgauges how the public will evaluate a horse. For example, Kentucky Derby entrant Keen Ice was 10/1 on the morning line for his second race. No one scratched, but bettors figured he was well-intentioned in the race and would appreciate the stretch out to a mile. He won – but as the 9/5 favorite, not a 10/1 price. A bookie has a challenging role: to minimize his risk, he needs to find people on both sides of a wager. Assuming he does this, his profit will come from what’s called the vigorish, or vig. When you exchange your dollars into euros at the airport, the currency dealer will give you a little less than market rate. This is a bit like the vig. In parimutuel, the house takes a cut of each pool, called the takeout. The takeout varies depending on the track and type of wager. Churchill Downs, for example, rakes 17.5% for straight bets (those on a single horse) and 22% for exotic bets (those involving multiple horses). More on that distinction soon. Payouts are always rounded down to the nearest 10 or 20 cents; if a horse would pay $7.69 given a raw calculation, the horse will actually pay $7.60. The difference – called the breakage – is retained by the operators. The opposite of breakage is a minus pool. Typically, a straight bet can pay no less than $2.10 on a $2.00 wager. If a favorite is so heavily bet that he would pay less than this, the track has to add enough money to the pool to make the bet pay $2.10 if it comes in. Another term for this is a bridgejumper scenario – because sometimes, that seemingly “sure thing” does not come in, and you may feel like you want to jump off a bridge for losing big on such a low-reward bet! Sometimes, a trainer will withdraw his horse from the race before it begins. This is called a scratch, and is a fact of life of horse racing. If you have a straight wager on a scratched horse, your wager will be refunded; if you have the scratched horse as part of an exotic wager, it will be replaced by the favorite. With the advent of the Internet, horse racing information has become easier to access. However, one advantage remains to those who are lucky enough to live near the racetrack and patient enough to spend time in the paddock: physical handicapping. Physical handicapping requires practice and time to become more familiar with horses. However, a few basics can make those trips to the paddock helpful even in the early stages. Horses running any distance should have well-defined muscle. However, in sprint races (typically defined as less than a mile), look for a big, muscular hind end: you like big butts, and you cannot lie. A more long and lithe build may suggest prowess in longer races; in turf races, horses with broader feet, reminiscent of a saucer, may take well to the grass. Paddock demeanor also can provide clues. Look for a horse who is poised, alert, and aware: ears pricked, looking around with interest. If he is bucking, rearing, or acting too unruly, he could be consuming valuable energy in the paddock instead of on the track. And if a horse looks drenched in sweat (“washy”), that is typically a red flag, particularly on a cooler day. Now that we’ve got the basics of parimutuel out of the way, let’s look at the various types of wagers you might place on your favorite horse(s). There are two main categories of bets. Straight wagers are on a single horse; exotic wagers require multiple horses to finish in a certain way, either in the same race or in consecutive races. Each category comprises a distinct pool. Win – you get paid if your horse wins the race. Place – you get paid if your horse finishes in the top two. Show – you get paid if your horse finishes in the top three. In other words, the first-place horse will pay win, place, and show bets; the second-place horse will pay place and show bets; the third-place horse will pay only the show bet. Typically, payouts get smaller as you go from win to show, although this is not always the case, since the pools are separate. Trifecta – pick the top three horses in order. Superfecta – pick the top four horses in order. This is typically used only for really important races. High 5 – pick the top five horses in order. This one is rare, but when it’s available, it often boasts a large guaranteed payout. Many tracks require horses with the same owner to run as a combined entry (1/1A/1X, 2/2B, 3/3C). In this case, they are the same betting interest: if you bet one, you have the other, as well. This can make exotics a little complicated at first blush. If the top three finishers in a race with one entry go 1A-1-5, then the exacta pays to 1-5. The entry functions as a single horse for betting purposes, so the bottom rung of the exacta skips to the next non-entry horse. Entries work similarly in deeper exotics as well. If the first five across the wire are 2B-2-1-1A-6, then the trifecta pays to 2-1-6. Let’s say you bet a trifecta on horse #1 to win, horse #5 to place (finish second), and horse #9 to show (finish third). If the horses finish 1-5-9, great! You’ve won. But you’re out of luck if they finish 5-1-9, 9-1-5, or any other permutation. To cover these possibilities, you can bet a box – every single possible order. This will cost more depending on the type of bet and how many horses you include in the box. A $1 trifecta box on three horses will cost you $6 total, since there are 3 possible horses in the first slot, 2 in the second, and 1 in the third. Maybe you’re confident where one horse will finish – say, you’re certain horse #2 will win – but you think several horses have a chance to finish second and third. In that case, you might bet a wheel, so named because the one horse serves as a “hub” for your bets. This is also called keying a horse, like the keystone of an arch. Sometimes, a winner may not be your strongest opinion in a race. Consider a horse on the Chicago circuit named W W Distinction. As of April 23, 2015, he had started 39 times with three wins, thirteen seconds, and four thirds. Ask yourself: how much does this horse really like to win? Often there will be a horse who runs competitively against similar company at the surface and distance, has speed figures that fit the field, and is well suited by the pace scenario – but the horse just does not win. The public keeps betting those horses because they seem “due” for a win. Again and again, the pack animal tendency kicks in with the “second-itis” horse, and everyone who had thought this horse was due for a win tears up their tickets. How can you profit from this? Two major ways. First: this could mean better odds on a different horse that you like to win the race. Second: if you are more intrigued by exotic wager, consider “keying” the horse with second-itis in second or third. That way, you bet your opinion that the horse will finish second or third but not win – and avoid wasting money. In a casino, you’d call this “letting it ride” – but here, you do it automatically. You bet the outcomes of several races in a row; if you’re successful, your winnings are automatically placed on the next race. Like compounded interest, your winnings can add up quickly. Say you start out with $20, and you get on horses in four consecutive races to show (finish in third or better). Let’s say you win the first race, and your horse returns you $30. That $30 is then automatically placed on the next horse on your ticket. If he loses, you’re out of luck; but if he wins, you’ll get even more cash to place on the next race. You will get paid only if all of your wagers are successful. Pick the winners of two consecutive races. Here’s a tie-in to Jeopardy! : Daily Doubles were almost renamed by NBC in the Art Fleming version because some executives were afraid of the allusion to horse wagering. These are Daily Doubles on speed: pick the winners of 3, 4, 5, or 6 consecutive races. Usually, a Pick 6 offers a big minimum payout and a carryover, which pushes the pool over to the next day in case there’s no winner. Note that Daily Doubles and Pick X wagers are not available on all races. Most horses have a preferred running style. Some are speed horses: they set the pace early, and do their best work from the front. Others like to hang a handful of lengths back, biding their time from the middle of the pack. A few are deep closers: fall far behind early, and come rolling late. When handicapping a race, it can be helpful to find a horse with a completely different pace preference from the rest of the field. A speed horse against a bunch of middle-of-the-packers, for example, is a lone speed. That might increase that horse’s chances to win, since he can dictate a slow pace early and have enough energy left to hold off those trying to make up ground late. On the other end of the spectrum is a pace meltdown: a situation in which multiple horses in the field try to strike the early lead. In that case, the speed horses will likely tire each other out, setting up well for a mid-pack or closing type to catch the leaders at the end. All right – that about covers it. Are you ready to win some dough? If you gamble on the horses this weekend, best of luck! And thanks once again to Nicolle for the excellent insight. After 6 decades on earth I finally figured it out. Thanks Keith! if I purchase a superfecta box ticket 1458 and the race finishes 1248(all 1-8) do I win? No, because you did not have 2 in your box. I place a 10 euro bet on Order of St George to be paced in the Arc de Triomphe Oct’16. He comes 3rd and the Pari Mutuel dividend is returned as 4.80 euro. Is my dividend 24 euro or 48 euro? ie Is the dividend paid to a 1 euro or a 2 euro stake?